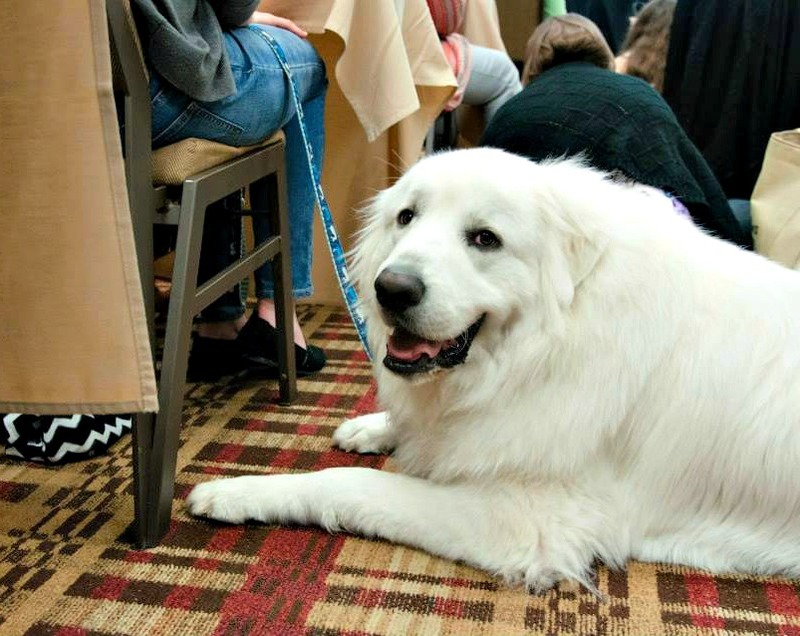 BlogPaws Nashville, 2015 ~ Pawsitively Humane, Inc.
How would you like to participate in a conference where you can bring your pet, stay in a hotel with your pet, attend a seminar with your pet, and bring your pet to all meals INSIDE a carpeted dining room. Is it possible? 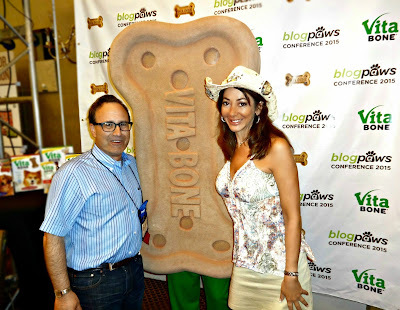 It is at BlogPaws! One of the many dogs at Blog Paws. Hey, that shirt and hat color look familiar! Board member Deb Barnes and I returned from the annual BlogPaws*, a social media conference for pet bloggers where it's all about pets- dogs, cats, ferrets, pigs and you can bring your pets. The theme was obvious--cowboy hats and boots to honor the country music history in Nashville, TN. Or the usual blue and purple hair. Why not?! While we didn't bring our pets, Deb and I took full advantage of the other highlights--attending sessions, networking with brands, catching up with fellow bloggers/friends and learning about the host city. We work hard on our blogs, a part-time hobby or paying job for some. So this is a time to continue learning, mingle, let loose and have fun! 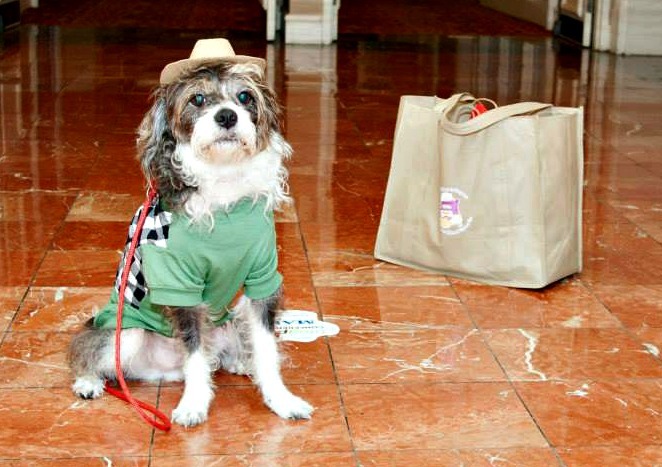 From the moment I step into the lobby, each year I'm consistently greeted by a dog. This year it was Rocco. Given the growing popularity of BlogPaws, it seems more dogs were in attendance this year and so we were surrounded by dogs everywhere all the time--lobby, hotel corridor, in seminars, at mealtime and awards ceremony! I sure hope this is what heaven looks like. As most of us rescuers say, "we would rather be with pets than people, so send us to pet heaven"! While a majority of pets were dogs, attendees were also treated to the presence of cats, ferrets, micropigs and a rat. My fascination with micro pigs started last summer when I discovered via social media a place in Bahamas where you can swim with the pigs! If I can combine my passion of pool and pigs --I'm in water heaven! So when Priscilla and Poppleton (aka Prissy and Pop) rolled in, heads turned. 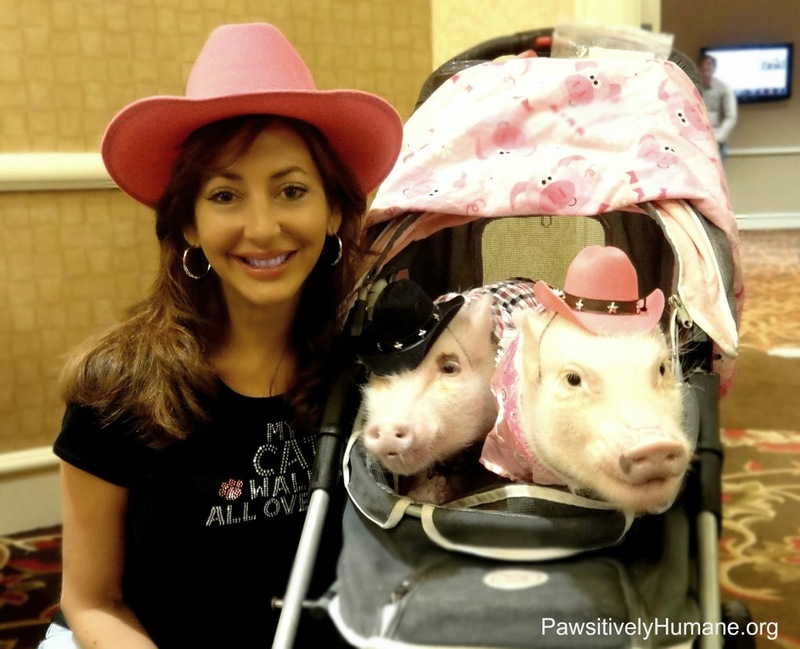 I shrieked when I saw Prissy was wearing a hot pink cowboy hat! Great fashionistas dress alike...I swear this was not planned. I should have known Prissy was a Florida gal --from Jacksonville! At last year's conference the capybara stole the show. But just when I thought what could top these adorable piggies, I met Everett--the pet rat! Looks like a gerbil or hamster but when Aby turned him around--the tail tells all! Eek. 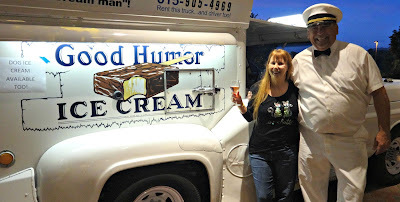 And after many attendees drove two days with their pets or traveled by plane and faced delays, awaiting us that evening was the Good Humor Ice Cream man and truck. 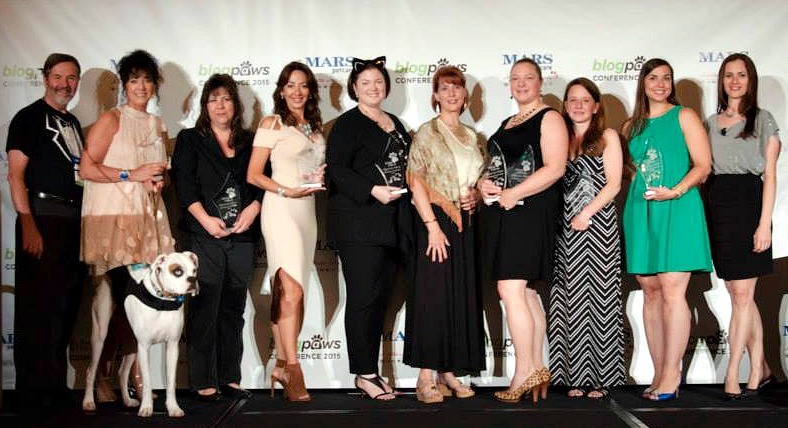 Way to go BlogPaws! A great "pick me up" after preparing for trip, packing and traveling all day! Dusty Rainbolt shows it's a Happy Hour with wine and ice cream! 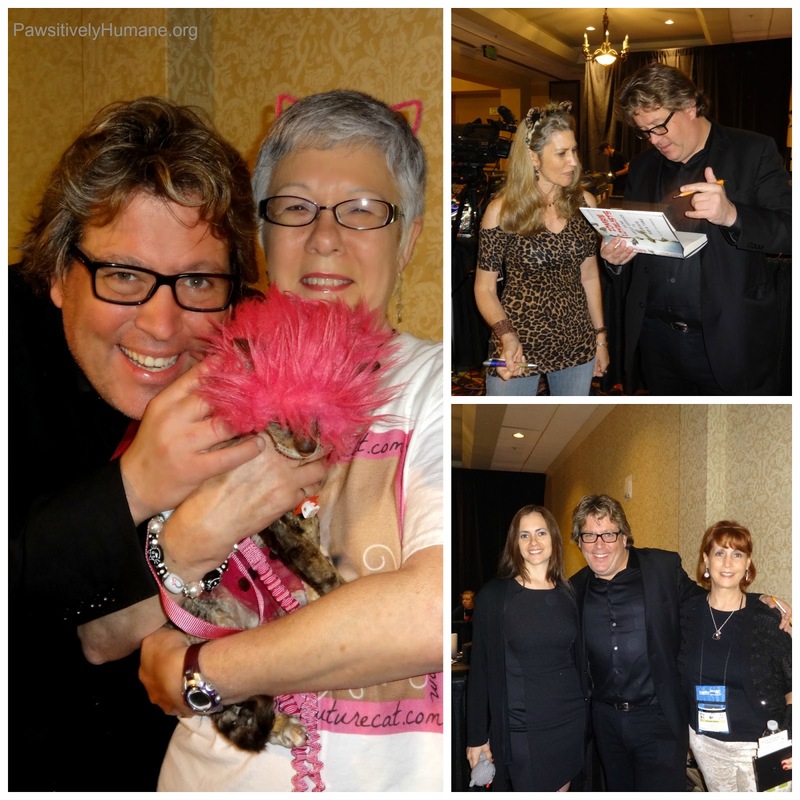 To set the tone and ignite the conference, BlogPaws soared to new heights in presenting the electrifying and comical Peter Shankman, founder of HARO (Help A Reporter Out) as the keynote speaker. The idea behind HARO is brilliant--a service that connects writers/journalists to news sources for their expertise. It was evident, given his success, that Peter understands the converging trends of technology, marketing and news and offered tips in preparing for it to stay ahead of the curve. 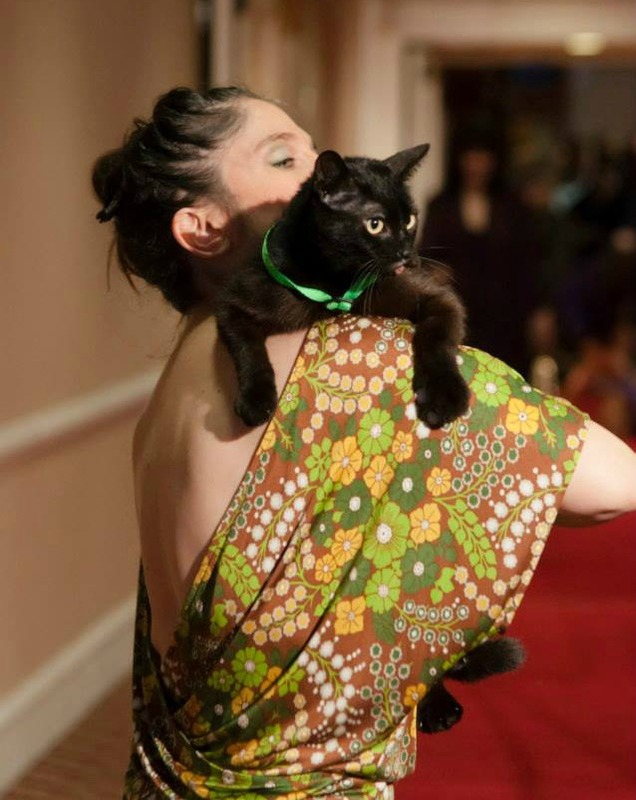 More importantly, he is also a cat man. Any man confident enough to wear cat ears for photo opps is a hero, Super Cat Man! 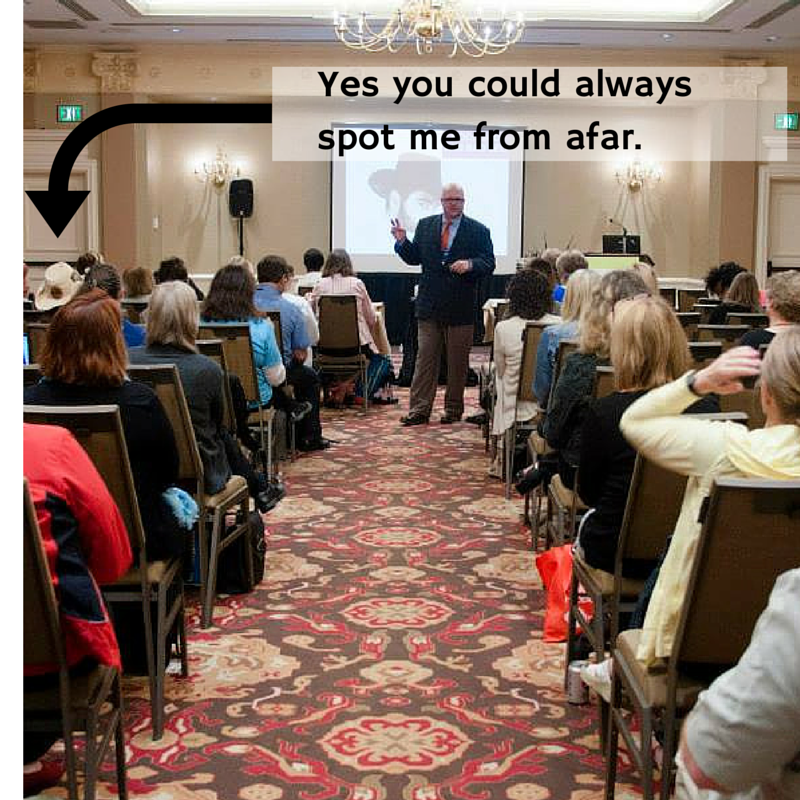 Yes despite all the socializing, networking and other fun, we do learn a lot. The attendees learn techniques to improve the design, presentation, flow, content, reach and exposure of their blog. Even though I've been blogging for six years now, I took a basic session as a refresher and now have graduated to the advanced sessions. Both were very helpful. Social media is constantly changing, evolving, especially Google. It's important to keep up to date. Most presenters were not only very knowledgeable but witty too. Never a dull moment at BlogPaws. An advantage of this conference is that presenter's share their contact information so you can followup with those burning questions. I'll be putting that to the test soon. No hiding in a crowd with this hat. At the seminar (pictured above), for basic SEO, the presenter challenged us to ask questions, difficult questions. He hadn't receive a question he couldn't answer. Was there anyone who could stump him? If so, there was a prize. Well sure enough, I did ask THE question and he admitted he couldn't answer with certainty! Aaah Bill Shroeder, I'm still waiting for that prize!!! While attendees were awake, alert and focused on the presenter (lots of wonderful espresso and coffee breaks help too), of course all the pets used the seminars as nap time. 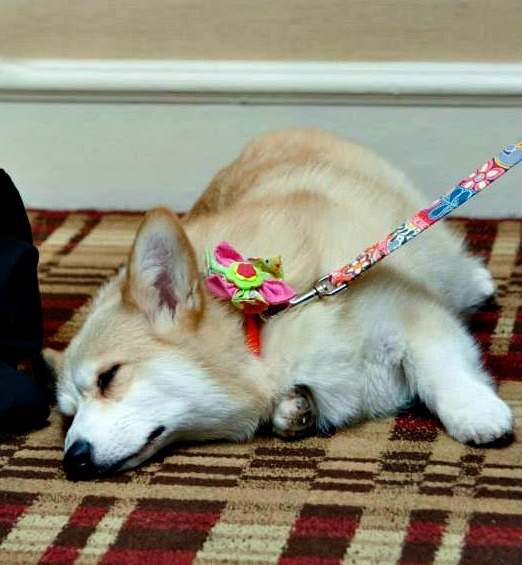 Can you imagine bringing your pet to work everyday? What a benefit. Thankfully I work from home when not in meetings or visiting with clients that I am blessed to have them surround me, and chew up my paperwork, and walk across my keyboard and delete what's on my screen...like having kids. But easier. Next, the Exhibit hall with pet brands and vendors. I felt like a kid at a new toy store, strolling down the aisles, scanning the new pet products, toys, food, treats. One has to be careful. 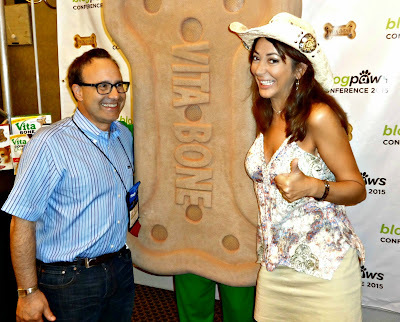 Some dog treats look like human food, good enough to eat! 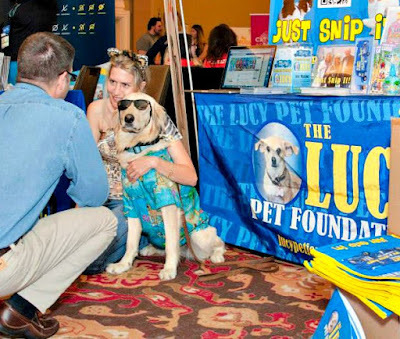 A benefit is the opportunity to ask questions directly to the company reps.
Bloggers then turn around and share this information with their readers. 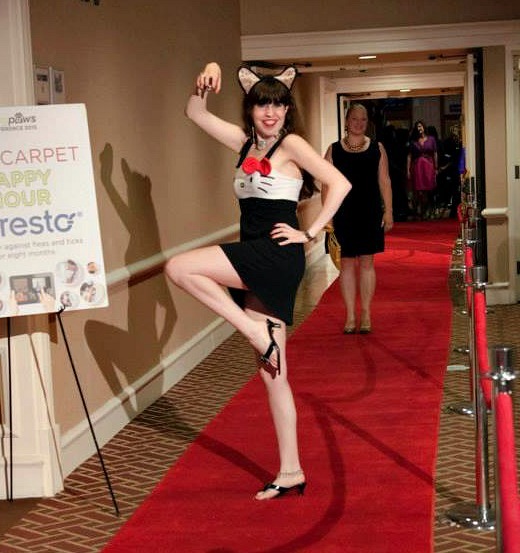 The final night is a chance to dress up, walk the red carpet, and enjoy a fine dinner before the Award Ceremony. 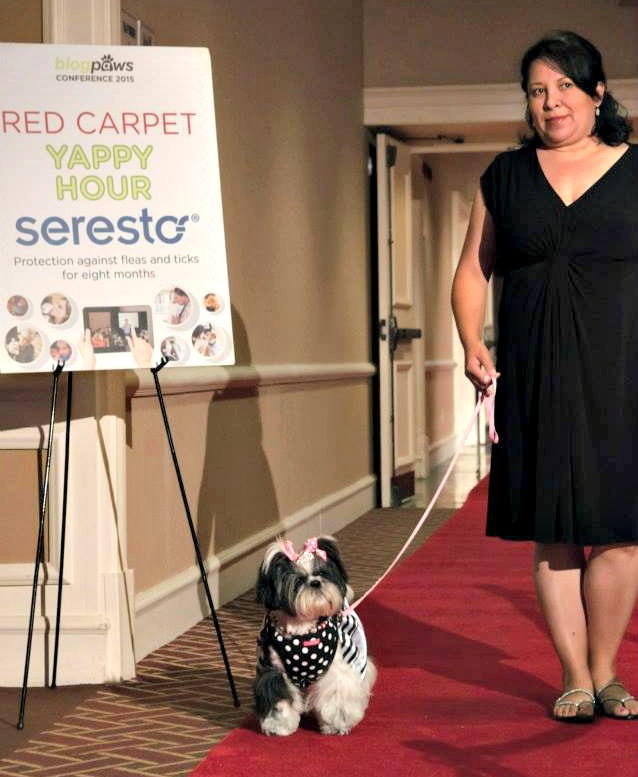 Remember no restrictions for pets at this conference so they also walked the red carpet and drank doggie cocktails at the Yappy Hour. Thank you Seresto for your sponsorship! A black cat on red carpet--now I'm feeling lucky! 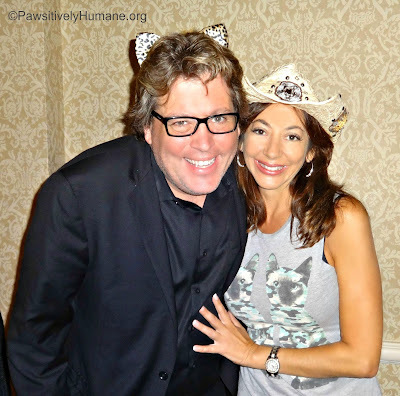 This year's ceremony was hosted by Dr. Tiffany and Nashville resident and pet radio host Harrison Forbes. 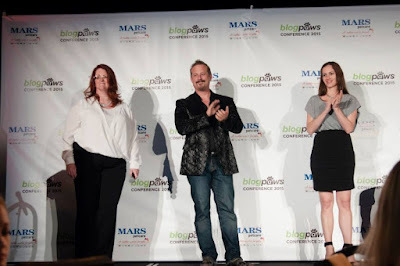 This year there were 12 categories from best blog post to most humorous blog to best nonprofit. Fans cheered us on in the forms of applause, barks, meows, and whatever noises ferrets and rats make. 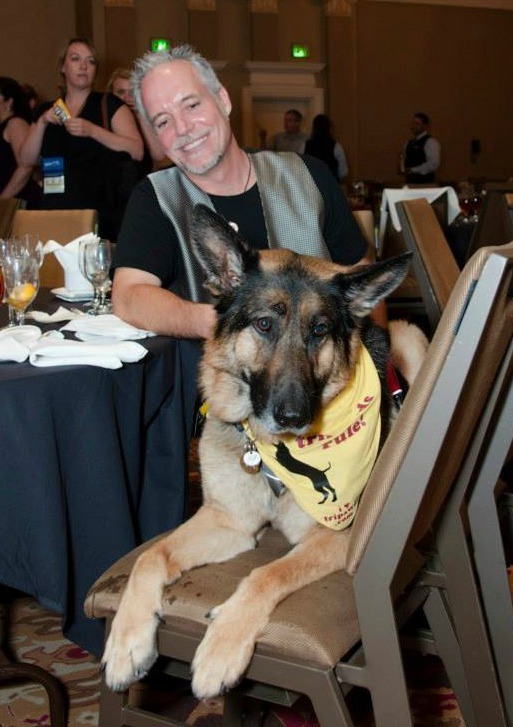 Below is a German Shepherd sitting on the dining room chair. 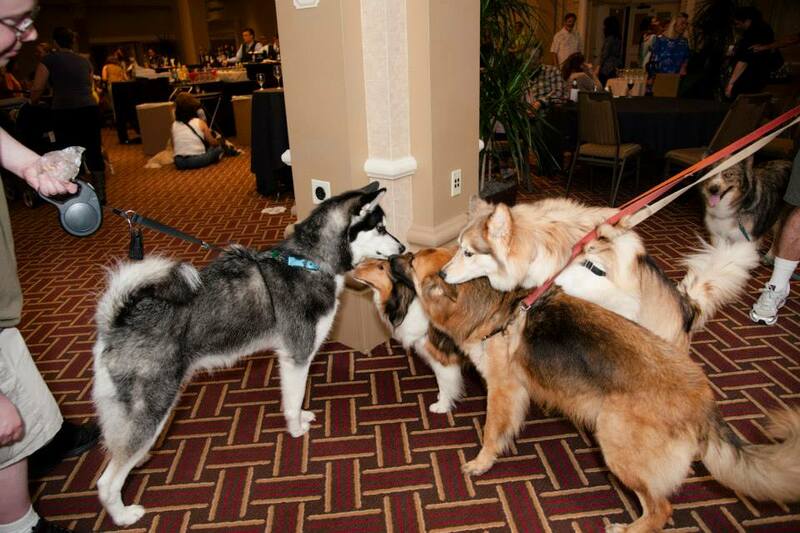 All pets were extremely well behaved. 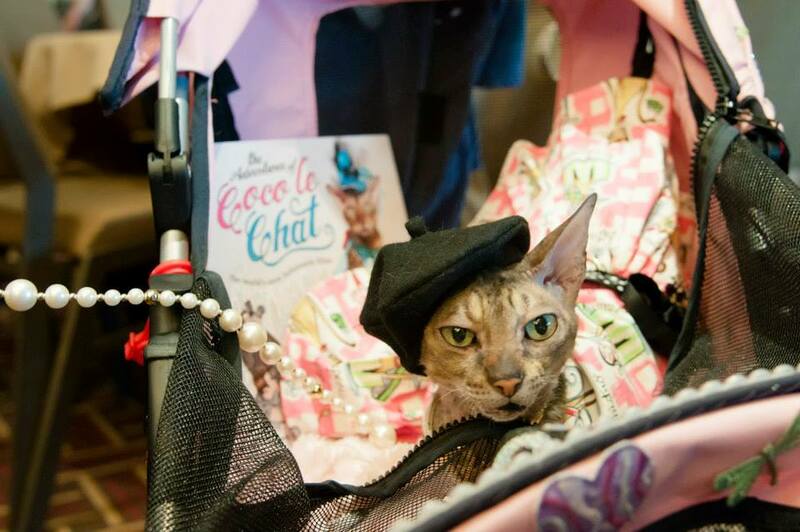 It's obvious these pets are used to traveling, and socializing with humans in human settings. 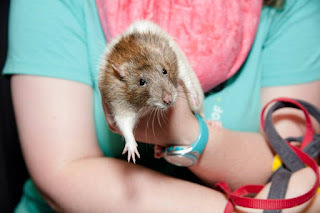 At my table sat Everett the pet rat! Deb Barnes and I were each nominated for an award. Deb is fortunate to have won prior awards. 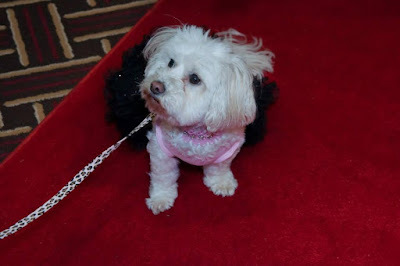 While I was nominated for two awards last year, I had yet to win. Until tonight. Kissy the black cat did bring me luck!!! To read the complete review click here. 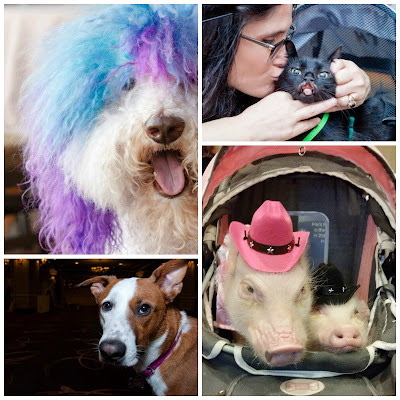 I am extremely honored to join the ranks of these talented bloggers that brilliantly use the stroke of a keyboard, words and social media to raise awareness about all pet related issues. From health to toys/products to humor. 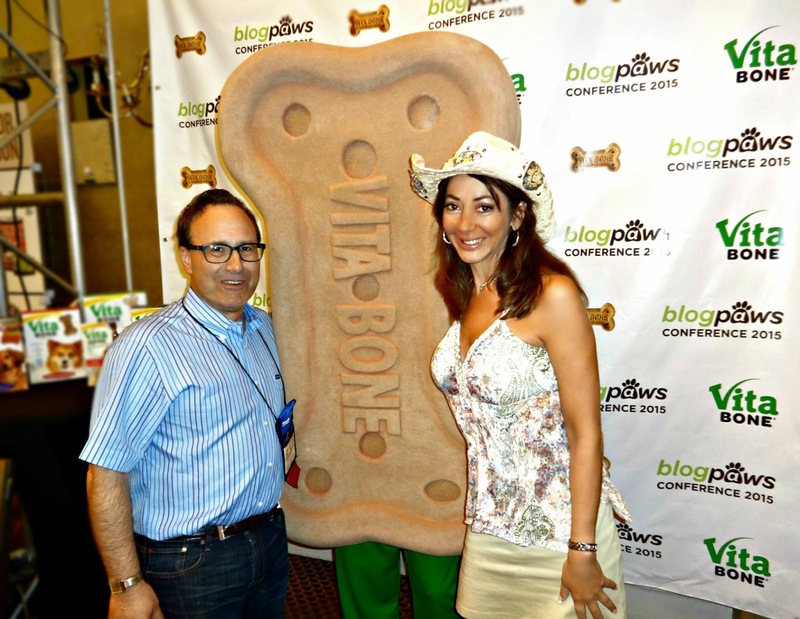 Thank you to all pet bloggers for your dedication, cooperation and love. 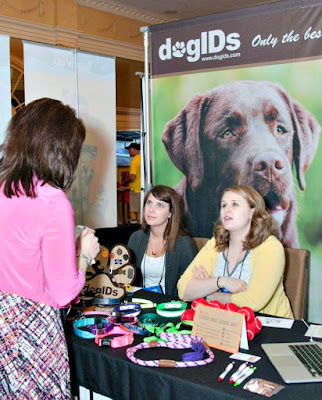 Thank you BlogPaws for another great conference. Thank you ALL for making this the best online pet blogging community. 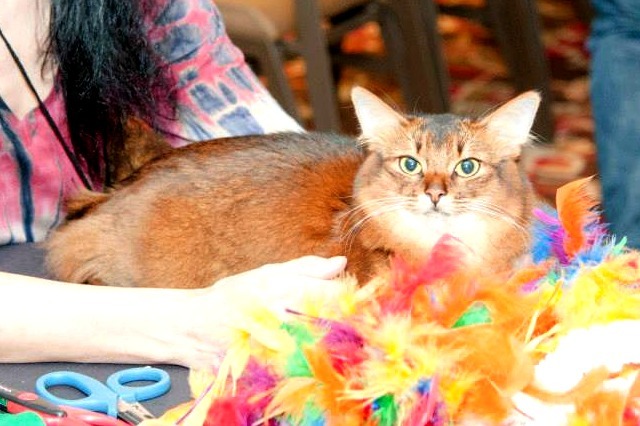 "See you all at next year's BlogPaws in Phoenix"
Coming soon, my review of BlogPaws (with more photos and stories) at Riverfront Cats and my personal blog. Photos by Christine Michaels and bybecka.com. Permission required to use. 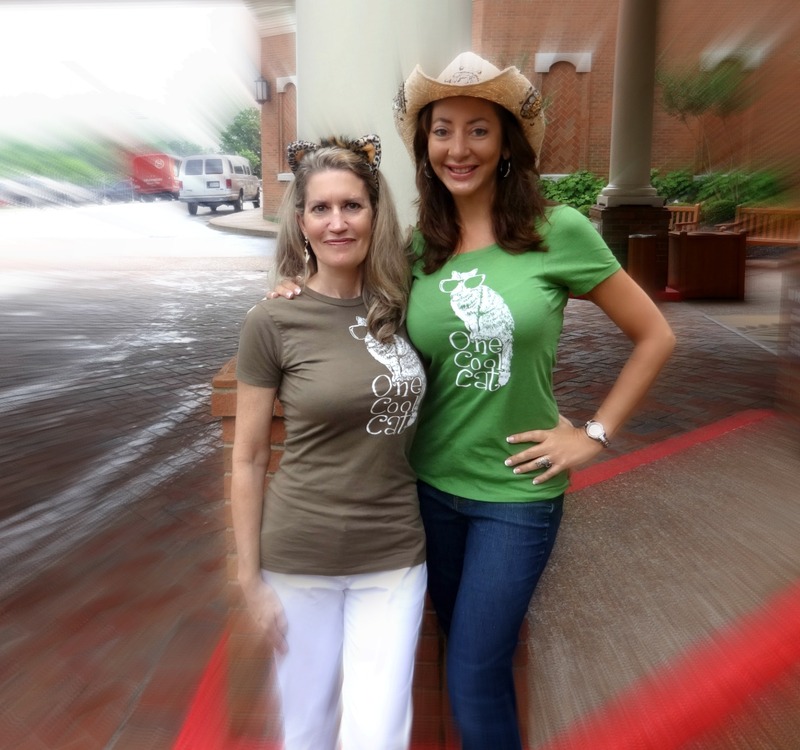 *Pawsitively Humane, Inc. (and Riverfront Cats) is a 501c(3). This trip was financed with personal funding. 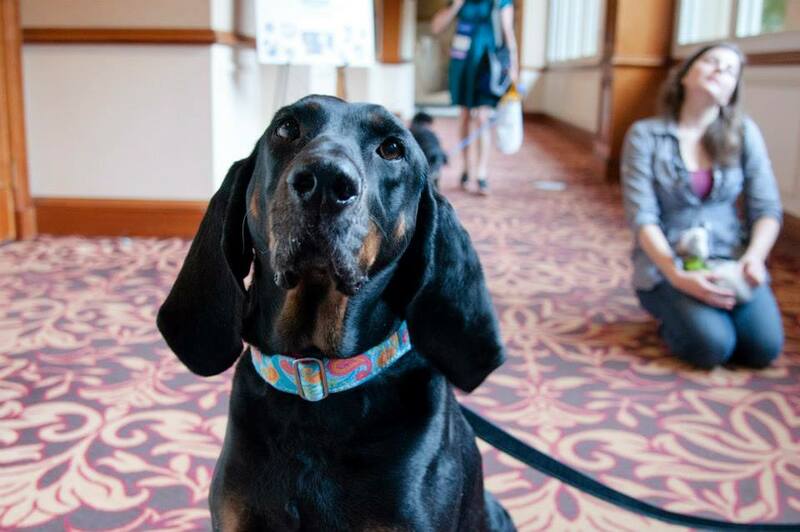 It's great that you have this conference and experience to complement, enhance and recognize the work that you and Deb do to help all pets. Glad you had fun. You deserve it! What a fantastic write-up to a fantastic conference! 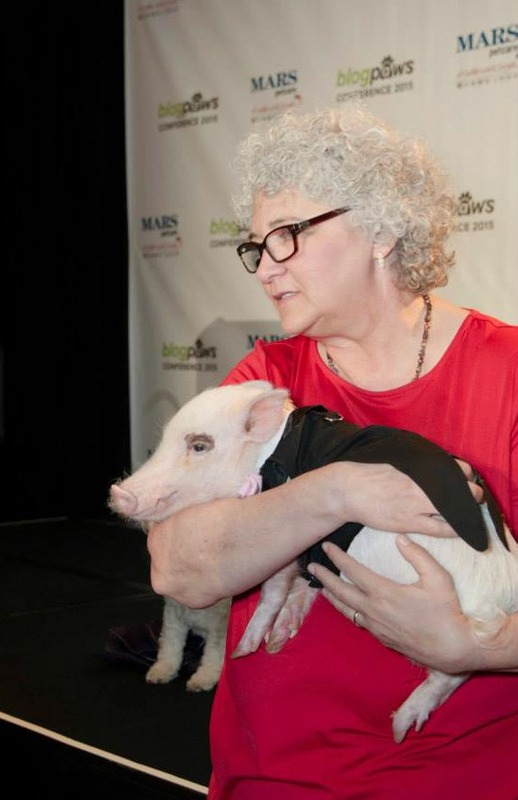 It's great to be among so many people who want to better the world for animals!